Rain Gardens; alternative stormwater drainage systems. A rain garden drainage system in Caledonia created a wetland common area. It will attract wildlife and provide and interesting and beautiful views for the residents to enjoy, enhancing both quality of life and property values. Stormwater is filtered in the wetland vegetation in the basin before release to groundwater and to Emmons Creek. Rain gardens are areas created to allow community rain water drainage to discharge to groundwater. This is a desirable alternative to overloading storm sewers with huge volumes of rain run-off. In a traditional stormwater system, rainwater goes directly into a local stream, carrying a load of fertilizer, pesticides, oil, gas, and other pollutants. A rain garden (bio-retention pond) can be constructed to naturally remove most of the pollutants from stormwater run-off. Rain gardens are either left to evolve in a natural wild condition, or can be planted with attractive, moisture-loving wildflowers, shrubs, and trees. Some of our most beautiful natural wildflowers will thrive if planted in a rain garden. Any rain garden, large or small, will enhance the landscape and help to reduce storm water processing costs, in addition to protecting surface water quality. A rain garden planted with native species will have additional value as wildlife habitat. or send me an email. Try it! Here are a number of online resources for more information on creating a rain garden. West Michigan Rain Gardens. A project to promote the use of rain gardens in West Michigan, and to share information about design and construction. 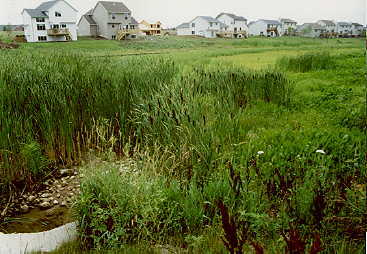 A Stormwater Marsh. A personal account of constructing a backyard rain garden; Brooklyn Botanic Gardens site. Wetland Nursery Plant list. A good list, with species and common names. From an online catalog. Midwest Wetland Flora. A field guide to wetland plants in our area. From the USGS site; complete with photos! Constructed Wetlands for wastewater treatment. A wastewater treatment system constructed for a school, with the wetlands/rain garden being an integral part. Rain Gardens; Virgina Dept. of Forestry. A nicely illustrated description of constructed rain gardens. Nice photos of some plants that will thrive in Michigan. Certify your Rain Garden! Did you create some great habitat? Is wildlife flocking to your new rain garden? National Wildlife Foundation's Backyard Habitat program will certify your efforts.